Webcam Punxsutawney, Pennsylvania: Punxsutawney Weather Discovery Center - A webcam in Punxsutawney, Pennsylvania - camera location: Punxsutawney Weather Discovery Center. Rural Valley, Pennsylvania: West Shamokin Jr/Sr High School, 20.7 mi. Foxburg, Pennsylvania: Allegheny Clarion Valley Junior High School, 38.6 mi. Altoona, Pennsylvania: Penn State University Altoona Campus, 40.4 mi. Export, Pennsylvania: Wellington Estates, 47.3 mi. New Kensington, Pennsylvania: Valley Middle School, 48.4 mi. Butler, Pennsylvania: Center Township, 48.6 mi. Kane, Pennsylvania: Kane Area SD, 49.8 mi. Latrobe, Pennsylvania: Greater Latrobe Jr/Sr High School, 51 mi. 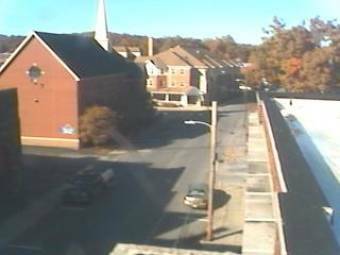 This webcam Punxsutawney, Pennsylvania with the theme City Views was added on September 13, 2010 and is operated by WeatherBug. It got 2228 visitors since then. Shouldn't this webcam work or should the link be wrong please report that here. You can add this webcam here to myCams.